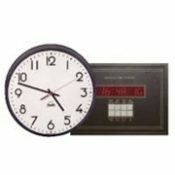 Franklin Quartz F Master Clock is a microprocessor/quartz crystal based time system controller designed to accurately drive a variety of low voltage Impulse, Midnight Reset, Sync Wire, and RS232 secondary clocks. When equipped with optional signal conversion, the Quartz F provides cost effective interconnect capabilities for the installer. User friendly and power efficient,it is ideal for office,school or industrial applications where the programming of signals or events is not required. Franklin’s MP Time Code Signal Conversion option allows interconnection of a variety of time system communication signal codes. Receive time code signals in one discipline, display that time as a secondary, then transmit synchronized time code in one or more different disciplines. Excellent for multiple buildings, intercom, time & attendance or computer network synchronization.